A cultivar of Camellia japonica L. ‘Flower three and a half inches in diameter, spheroidal, very full and forming a regular rose, the petals of which diminish in size towards the centre, and are mutually imbricated from the centre to the circumference, each has a free border, a little sinuous, entire, two lines broad in the centre and augmenting to twenty-five lines in the periphery; they are white with distinct red or white stripes.-Magnificent.’ [Berlèse Monography p.88/1838]. 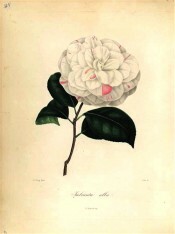 See also Camellia japonica L. var. imbricata. It was bred by Hugh Low in England about 1833 from ‘Alba Simplex’. [FC p.154/1836]. Berlèse Iconographie vol.I pl.40/1841. Listed in all published catalogues [T.233/1843]. A plant was presented to the Sydney Botanic Garden on December 24th 1845 [RBGS AB].